Three easy steps are all it takes! When the weather is still warm, the last thing you want to do is sit inside and blow-dry your hair. Give your blow-dryer a break and embrace air-dried waves. Celebrities and taste makers alike have embraced heat-free, natural-looking waves with open arms, and you can too! Aside from being a total breeze to achieve (little-to-no styling is needed! ), the look is also a step in the right direction to dial down on applying direct heat to your mane. Ready to give the trend a try? Read on for expert tips on how to achieve naturally air-dried waves. Step one: After washing your hair, pre-dry your strands with a towel and then part it with your fingers. Towel-drying can make your hair a bit knotty, so lightly combing it through once is OK, but you don’t want to overdo it. You want to be sure to keep your hair’s natural movement intact while avoiding frizz. 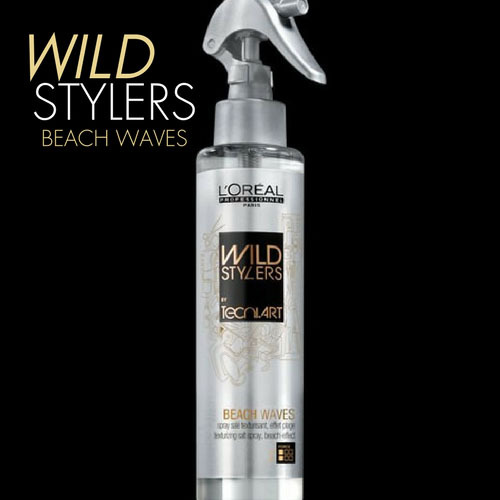 Step two: Next, spray L’Oréal Professionnel Tecni.Art Wild Stylers Beach Waves onto your lengths. Squeeze and sculpt the hair with your hands to deliver movement and texture. For ropy waves, clip your hair into small twists and leave it to air dry. Step three: For a disheveled look, finish off your style with a few spritzes of L’Oréal Professionnel Wild Stylers Next Day Hair. For a polished finish, work a serum or hair oil into your ends and lengths. That’s it! You’re just three steps away from achieving this low effort, high reward style.